Are you concerned about your out-of-the-box Microsoft Project Connector? You're not alone, and we've got a solution that resolves its speed, performance, and reliability issues. 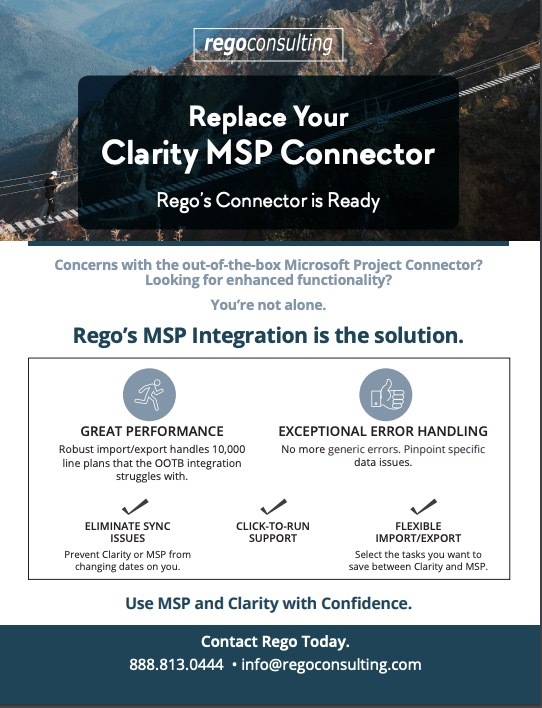 Introducing Rego's Clarity MSP Connector! This connector has great performance and can even handle 10,000-line plans. You won't see anymore generic error statements. 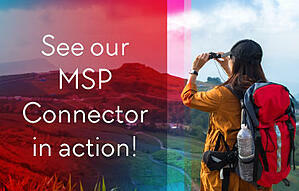 It has flexible import and export capabilities, so you can control the Tasks you save between Clarity and MSP. And it eliminates the syncing issues—which means no more unwanted date changes. We wrote the code using the latest .NET technology and optimized the MSP Connector for fast saving and server opening by decreasing the payload size. In short, you'll love it. Check out our demo below and sign up for a free 30-day trial. Want to see it in action? Watch this on demand webinar with Rego Guide Taunya Moore. She's the world's leading product expert on both the out-of-the-box connector and Rego's connector, and we're very happy she's joined our team. We'll provide a proof of concept for 30-days (in a non-production environment), so you can test the MSP Connector with your team. Just contact one of our expert guides today, and we'll set it up for you. Want a file for your records or to share with your organization? Here's the product sheet.